Rococo (pronounced roh-coh-coh) is also known as Late Baroque by some antiques enthusiasts and historians. While not as common, it can also be spelled roccoco referencing the same style. 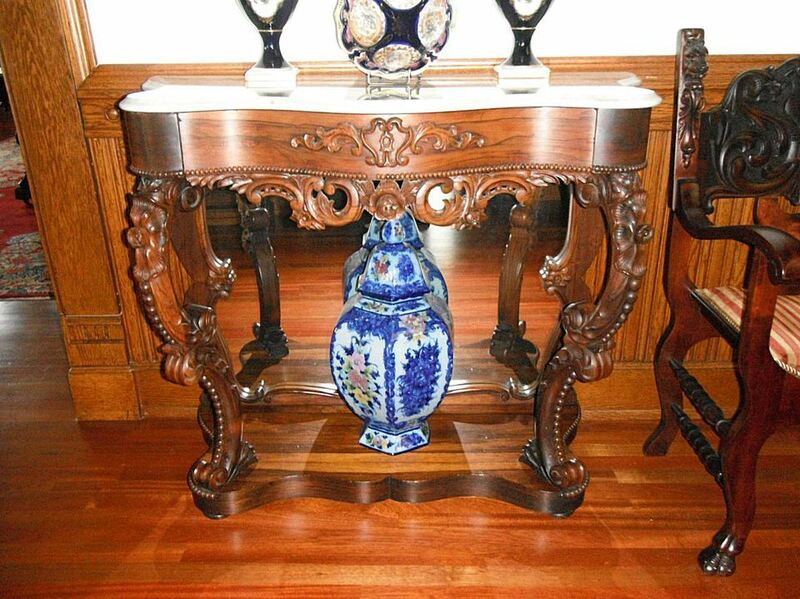 This type of furniture originally came about as an offshoot of architectural styles popular in the late 1600s. By the early 1700s, it was seen in all forms of artistic expression in France including painting, sculpture, and interior design. The highly embellished furniture decorating rooms of this period often featured whimsical themes incorporating asymmetry, curves, and gold finishes - these are true Rococo pieces. This grand style is most often associated with the reign of Louis XV moving into that of Louis XVI. It was supplanted by the more subdued Neoclassic style as its popularity waned. Most pieces of Rococo furniture seen today, whether in antique stores or at auction, are actually Rococo Revival pieces dating to the mid-1800s. According to American Furniture: Tables, Chairs, Sofas and Beds by Marvin D. Schwartz, this style was seen in earlier English style books but it wasn’t introduced in the United States until the early 1840s. Rococo Revival remained popular well into the 1860s, thus making it a subset of what is considered to be Victorian furniture, along with a number of other revival styles. While this style was produced throughout America, the pieces from New York, Philadelphia, and Boston are the most well known and documented. Schwartz credits John Henry Belter of New York, known for working with laminated wood, as one of the most notable Rococo Revival craftsmen of his day. The name "Belter" has been rather loosely associated with many pieces of this type of furniture, sometimes erroneously, but can usually be affirmed by looking at the overall style and quality of the carving present. The southern United States is also known for producing beautiful Rococo Revival pieces, especially those originating in the New Orleans, Louisiana area. These are not well documented, however, and little is known about the firms or craftsmen who made them. Harkening back to Rococo origins of the 1700s, Rococo Revival pieces are sometimes referred to as Louis XV or Louis XVI style. The main difference in the older Rococo and later Rococo Revival furniture is the boldness of the pieces made during the mid-1800s, which had more realistic representations in the carvings and they were executed in much higher relief. A variety of different woods were used in Rococo Revival furniture with rosewood and mahogany being dominant in higher-end pieces. Walnut was used for lesser quality designs. The elaborate carvings found on these pieces included cherub, fruit, shell, flower, and scroll motifs inspired by 18th-century Rococo designs. These monumental carvings, both pierced and solid examples, were almost always featured on furniture with exaggerated curves. The cabriole leg was used on most of this type of furniture regardless of the foot style, but some scrolled legs were also used. Most chairs made during this time had balloon backs. Many of these pieces were upholstered, some with tufts, as inner springs were perfected and comfort became more of a consideration during this period, according to Schwartz. The use of Rococo Revival embellishment was reserved predominantly for living room and bedroom furniture. Parlor sets can include sofas or settees in numerous styles, center and side tables with marble tops, and a variety of chair styles both with upholstered and open backs. New-for-the-time pieces included the tête-à-tête conversational sofa, and the méridienne settee or daybed, sometimes sold in facing pairs, remained popular during this era. Bedroom sets included intricately carved bed frames, either in two or four parts and matching side tables. Other accessory pieces made in this style included piano stools, tilt-top tables, card tables, and sewing tables. This style was also popular in furniture intended for outdoor use, such as cast iron pieces manufactured by Coalbrookdale among other companies. Grape and leaf patterns were popular on these pieces, and many are marked with the manufacturer’s name molded into the iron or on a cartouche attached to the back.